Whether you're a kid or a grown up, you'll love this one. 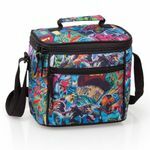 Beautiful and handy lunch bag fully insulated and perfect to keep food and drinks always fresh. Matching backpack and pencil case also available.